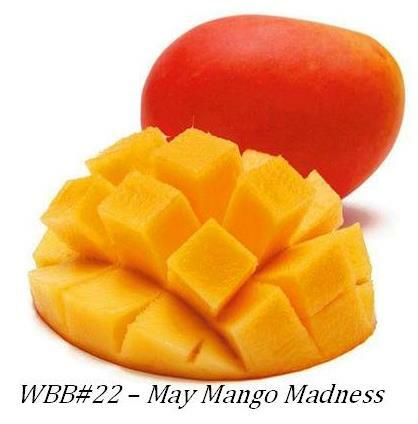 WBB#22 – May Mango Madness – the Roundup is finally here! The good doctor quizzed me on my interest in hosting WBB for may sometime in April….nothing in the chat transcript told her how much at sea I was and that I was terrified….then we both forgot about it…..or so I thought….april came and went and at the beginning of may, came april’s round up……mid afternoon bolt from the blue sms from my namesake asked me where my announcement was…..have you ever broken into a cold sweat?? 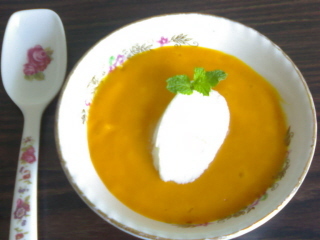 I did….i know you must be thinking I am crazy….but food blogging did this to me….convinced that I was better off making anonymous comments on blogs and wondering why the hell I agreed to this……I posted the announcement…..choosing (unimaginatively because they were assaulting my senses at that time) Mangoes…..and waited with bated breath!! In the meanwhile I went about harassing all my blogger friends, via email and chat….and made quite a job of it!! the last four weeks have been hectic…for anyone who’s been reading my blog…..K’s part of the family has been here and we were travelling…. Not to mention that the laptop decided to go kaput and then the broadband at home went on vacation….when everything settled into a not so dramatic mode……I didn’t have the time in life to do anything about the roundup…..and I have tried today to remedy it!! 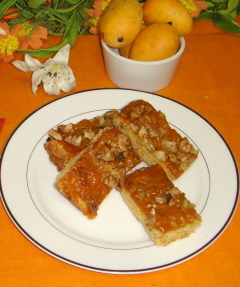 i was delighted with the entries for mango madness…..raw and ripe, they tickled the palette and made for some interesting breakfast treats……here they are….many many thanks to all those who sent in their creations……please let me know if any entry sent hasn’t been posted here…….cheers!! and what a delightful madness it has been!! So here it is…….i’ve tried to categorise as best as i could………. 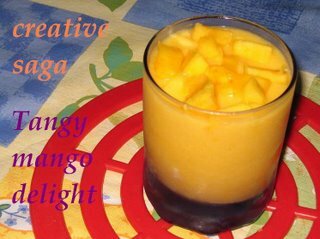 Sowmya of Creative Saga, discovers alphonsos with a vengeance……after being pretty neutral about the fruit for years…..she whips up this tangy mango delight…..now mango pulp, orange juice and whipped cream….that’s what i call an explosive start to the day!!! 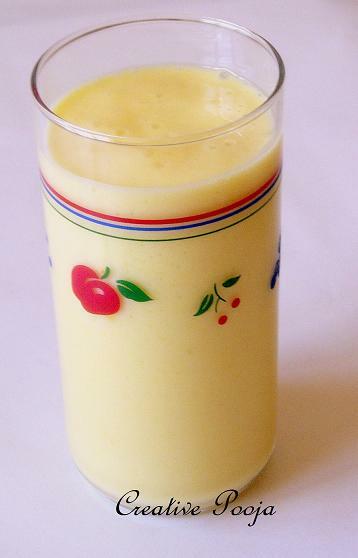 Pooja of My Creative Ideas makes this breakfast in a glass…mango thick shake with mango and bananas with milk…..she was rankled for a choice….but I think she couldn’t have chosen a more fitting entry!! 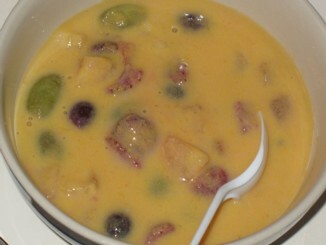 Rupa of Random Musings, dear friend and endurer of much nagging thinks that food blogging is not her cup of tea…..yet I wish to tell her that we all thought the same before taking the plunge….for starters, she takes the food detour from her personal blogging just to serve us this fruit yoghurt…. 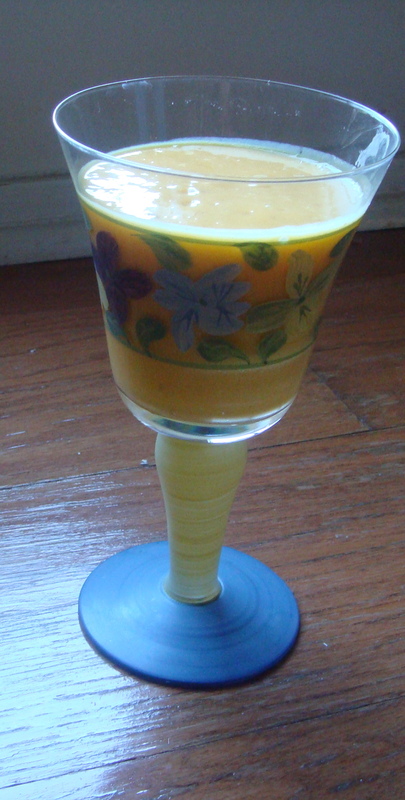 Shoba of Nangil Girl’s Adventures sends in this mango banana smoothie for breakfast……might I add that I loved the glass?? 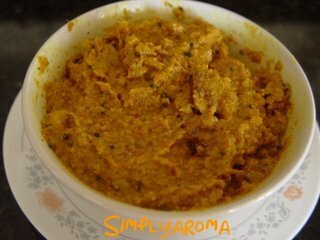 Jyothsna of Curry Bazar makes this beautiful aamras, with rotis, puris, plain or as a fitting end to a meal, aamras is always a recipe for surefire praise!! 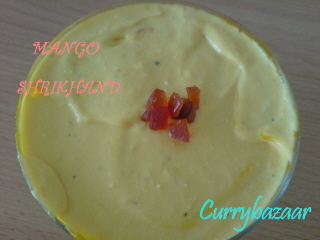 Foodyguru Srimathi of Few Minute Wonders sent in this Mango trifle pudding as her entry……now you are talking breakfast!! 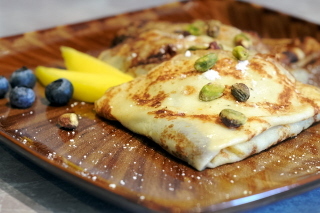 I love the idea of indulgence in the morning…..!! 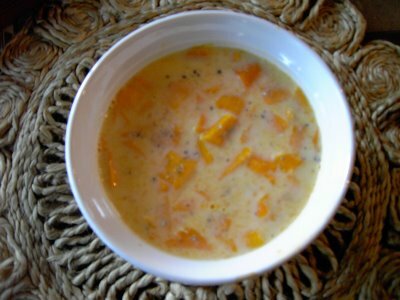 Jan of Food with a pinch of Love sent in this elaichi aamras fruit custard taking fusion to another level…..
Meera of Enjoy Indian Food makes this Mango Shikran, she says it was never served at breakfast, but fruit and milk cannot hurt anyone…..and I absolutely agree!! 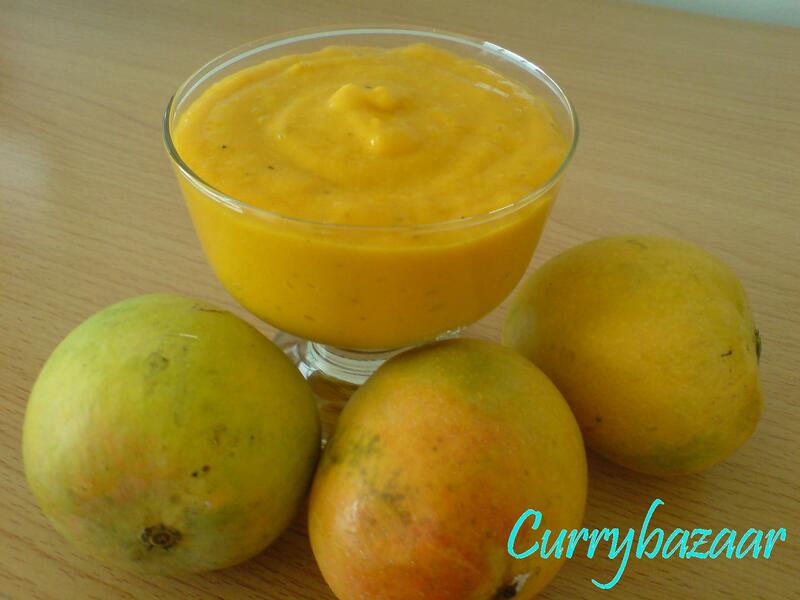 Jyothsna’s Curry Bazar brings to the breakfast table, amarkhand – mango shrikhand….served with hot puris this makes for a traditionally fabulous breakfast……psst…you can also forget the puris and dig straight into the amarkhand if you like!! 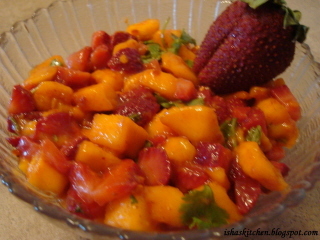 Isha of Isha’s Kitchen sends in a blend of two popular flavours in her strawberry mango salad, the addition of cumin and red chilli powder only serves to enhance the flavours of the fruit I am sure!! 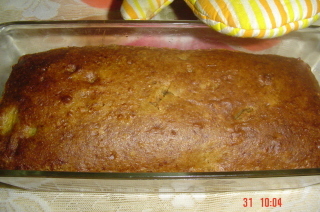 This feisty talented baker, wears many hats with much elan…..and she too did get the bugging she didn’t deserve….what can I do…I was plagued with thoughts that no one would send me any entries and I had to turn to (quite literally) to the friends I made off the blogosphere…..deeba of passionate about baking sent in this fruitilicious Mango Fruit Salad to begin the day and get me firmly off her back!! 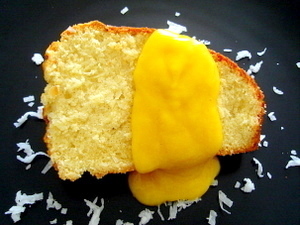 Asha of Foodie’s Hope baked this lovely Mango –coconut pound cake and serves it up with some great mango sauce!! 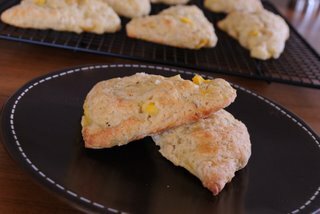 Kalai of Samaithu Paarkalam sent in these fabulous Mango Scones…….i’m hurrying over for breakfast lady!! 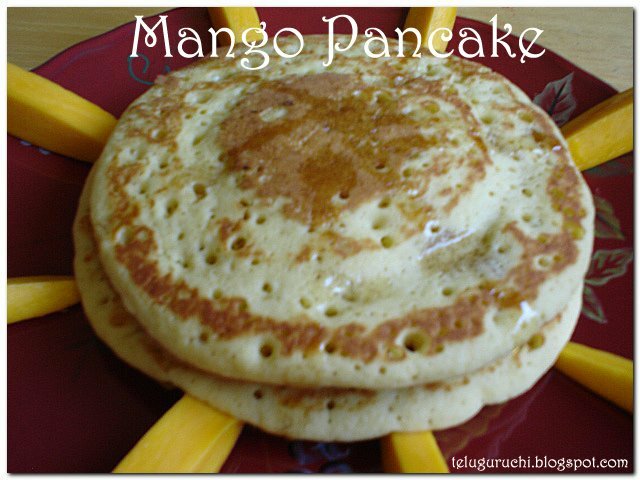 Uma of the essence of Andhra, sends in this mango pancake…..the unique addition of mango juice to make the batter, and chilli and cumin, gives it a nicely different edge. 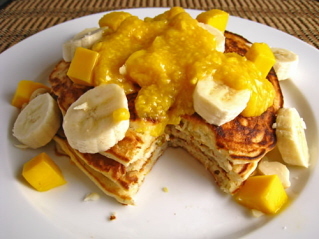 Kevin of closet cooking sends in these awesome mango banana pancakes which uses coconut milk and cardamom to make it flavourful. 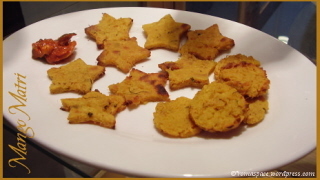 Priya of Live to cook makes some mango potato griddle cake, otherwise called adai…..she uses an unusual combination of raw mango and potato for this and immediatelty alerted my “must try” list!! 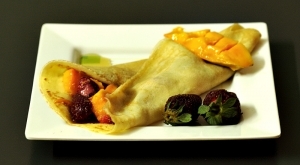 Crepes turned out to be very popular …..Possibly because they pair rather well with mangoes….we had four servings of them……. 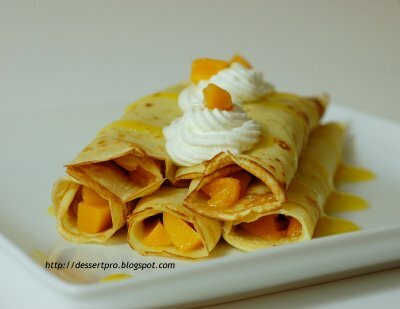 Sukanya of Hot and Sweet Bowl serves us these fabulous looking Mango Crepes, sinfully flavourful with chopped mango pieces and whipped cream!! Makes me want to crash this breakfast table!! 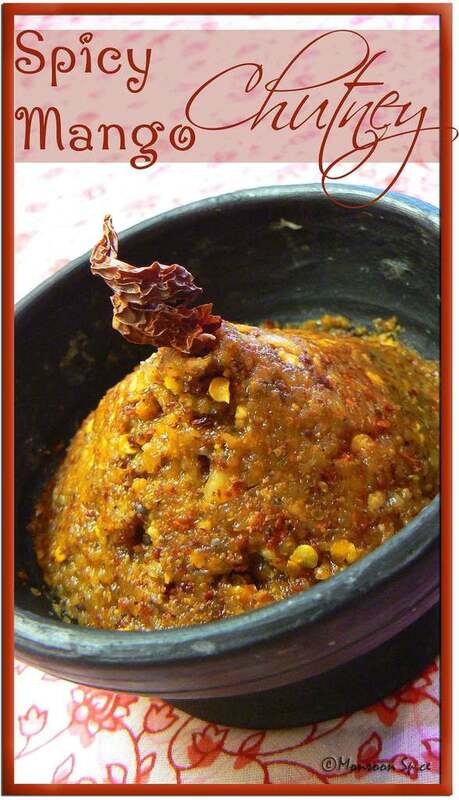 Alka’s Sindhi Rasoi dishes out the indian answer to the mother of all jams, Mango Murba takes me …back to my childhood when all kinds of jams were made to preserve and use the surplus of fruit we had…..murba was one of the star attractions…. 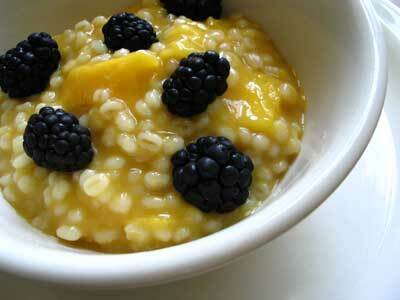 Lisa of Lisa’s Kitchen has a way with words……..how else can you explain this “Tangy chunks of mango in a thick, creamy mango juice broth surrounding soft and chewy grains of barley, topped with the mild tartness of fresh blackberries — even the most reluctant of porridge eaters will be back for a second bowl of this naturally sweet and colourful breakfast delight” she had me scurrying over to find this beautiful Mango barley porridge with blackberries…….and rarely do I call porridge beautiful!! 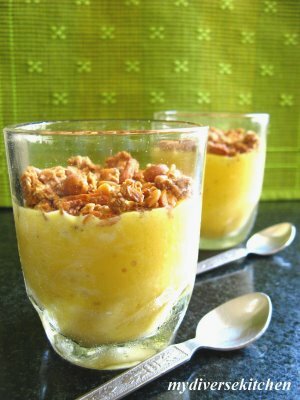 Aparna and her Diverse Kitchen took a leaf off none other than Nigella Lawson’s show and made up this Mango Parfait with home made granola….this dear Aparna, deserves to be on a show by itself!! 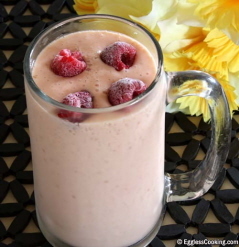 Talk about a goddess dishing out balanced breakfasts!! 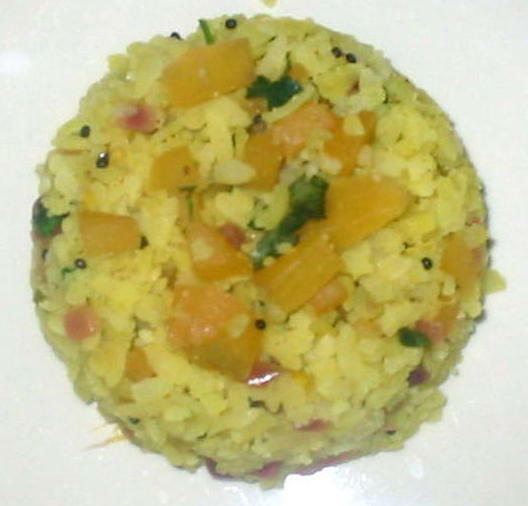 Revathi of Here it is sends in this innovative dish she calls Mango Something…..using bell peppers and ripe mangoes….it can be had on its own, or as an accompaniment to roti…..
Raji of Talimpu sends in this Raw Mango Upma using rice flour……the picture looks good enough to eat! 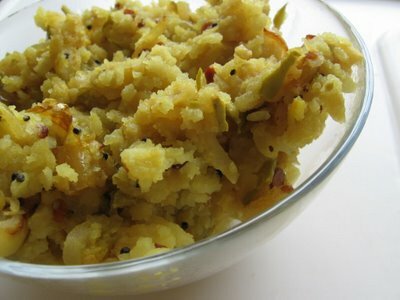 Roma of Roma’s Space sends us Matris, a fave north indian snack / breakfast using raw mango that was straight from her neighbor’s garden!! 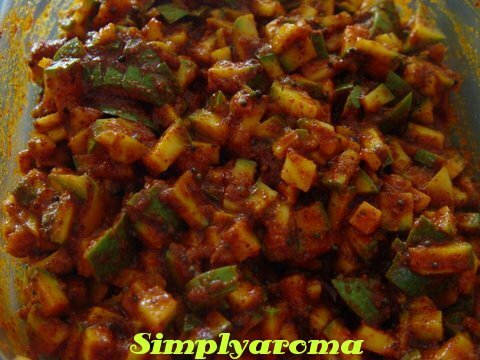 Rupa of Simply Aroma sent in this tantalizing Instant Mango Pickle, a perfect accompaniment for any meal and whats more is totally fuss free!! 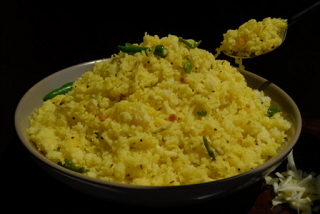 Easy Crafts of Simple Indian Food sent in Maankaai thokku that’s a versatile side dish for idlis, dosas, chapattis and rice too!! 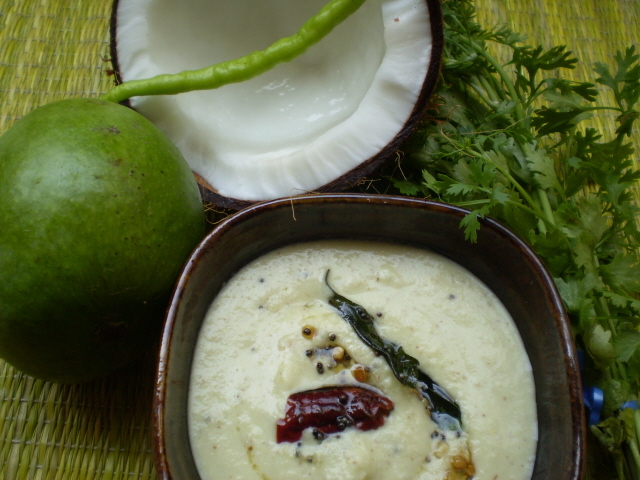 The Jugalbandits from where else….Jugalbandi send in this mango and coconut chutney that accompanied their crazy upma!! 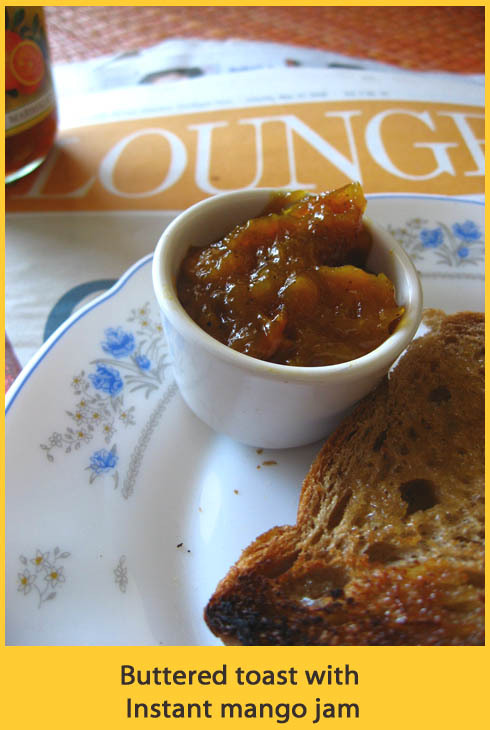 Sia of Monsoon Spice sent in another mango chutney she calls Spicy Mango chutney…she tells a lovely story of a childhood spent in bliss and mangoes contributed in a large dose to this!! 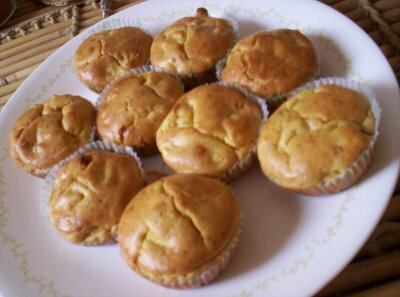 My namesake of the Singing Chef sent me not one, not two….hold your breath, three terrific entries to boost my confidence of hosting mango madness…..i think she is a true foodie….thanks girl…..check out her Chickpeas Sundal, Kairi Panha and Mango Muffins….. Thanks again Nandita, for sending WBB over to Escapades…….thank you all who sent in your entries (please let me know if i have missed any) and am so sorry for the long delay in posting the roundup!! This is exciting, You’re an excessively professional blogger. I’ve joined your rss and stay up for searching for even more of your excellent publish. Also, I’ve got shared your site within my web sites! I am definitely impressed together with your writing skills in addition to with the page layout on your blog post. Is it a paid theme or do you colorize it for you all by yourself? 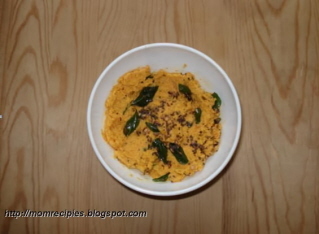 No matter what continue the superb good quality writing, it’s actually unusual to see a good weblog such as this one these days..
Arundati, Mango is my favorite food, and one of the things I most miss about India. 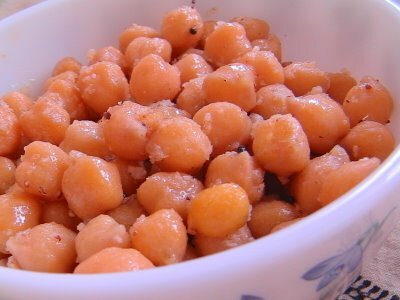 I was lucky enough to be in India this summer to eat lots of them, though. I wish I had been around to participate in this gorgeous event- congratulations on a great round-up! 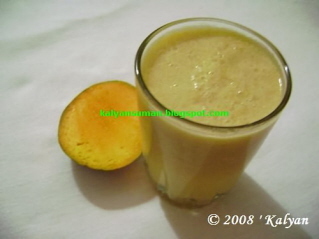 dear vaishali, am so glad that you were able to enjoy mangoes this year!! 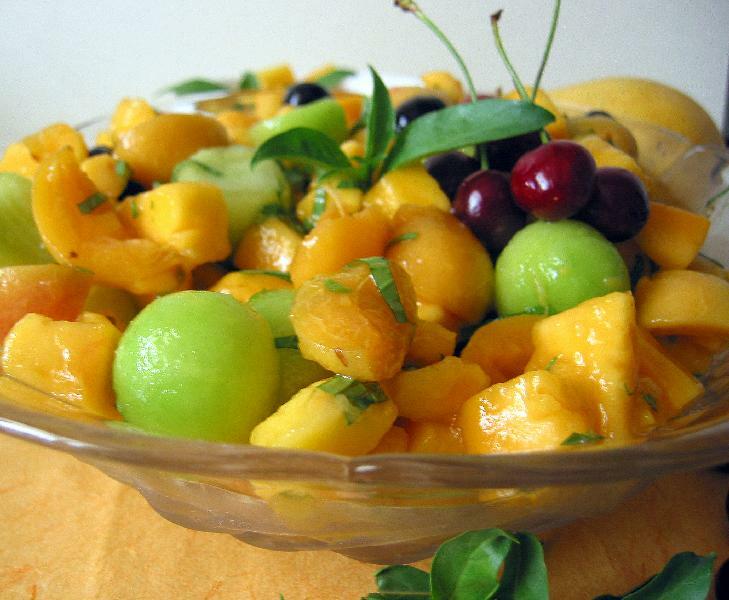 for what is summer without mangoes!! 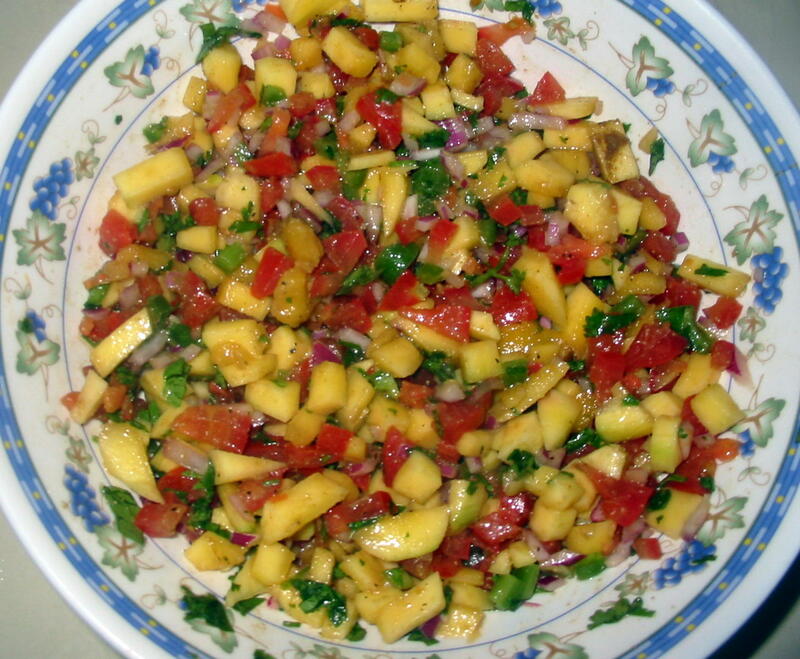 Wow never seen sooo many mango dishes together. 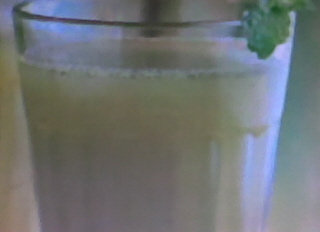 Love trying and seeing new things what can I say – Thanks for all this , YYYYYUUUUMMYYY!!! 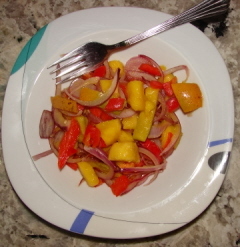 Jeeeez what a treat, enough to publish a cook book on mango. great job arundathi. oh and thanks too. Lovely Roundup Arundhathi! 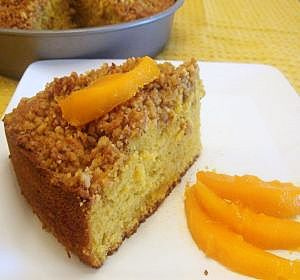 😀 indeed a ‘Mango Madness’! yes!! and the maddest of them all got to play hostess!! 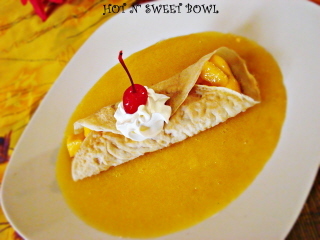 I missed out on this…..
i’m coming over immediately….kulfi is something i love….and mango kulfi….sounds divine!! Wow! So many entries!! Great job with the round-up, Arundati. Thanks for doing this amidst your very busy schedule! 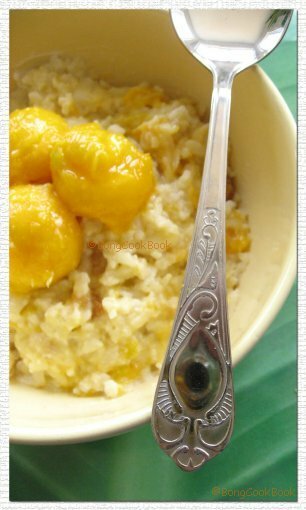 I know how hectic blogging turns into sometimes…that too hosting a event with guests around, you have done a great job.lovely entries with neat roundups. 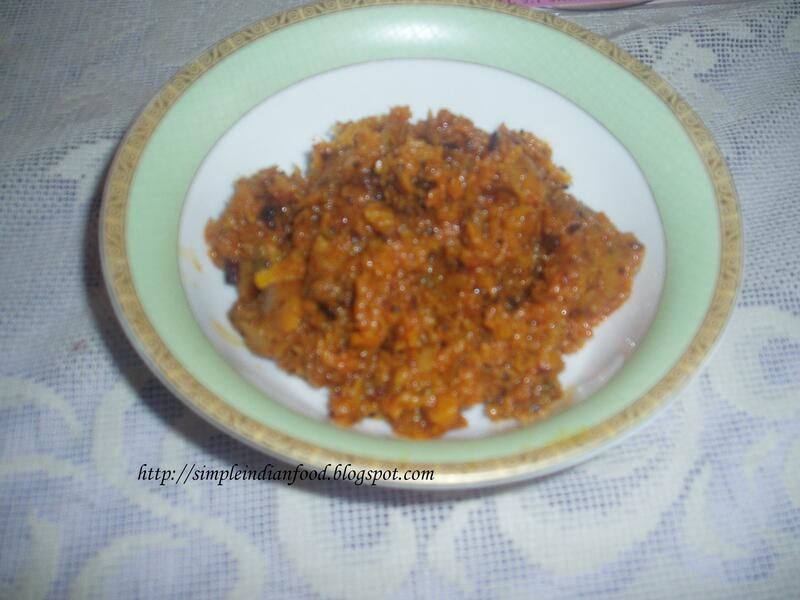 wonderful round up, Arundati! Kudos to your efforts. 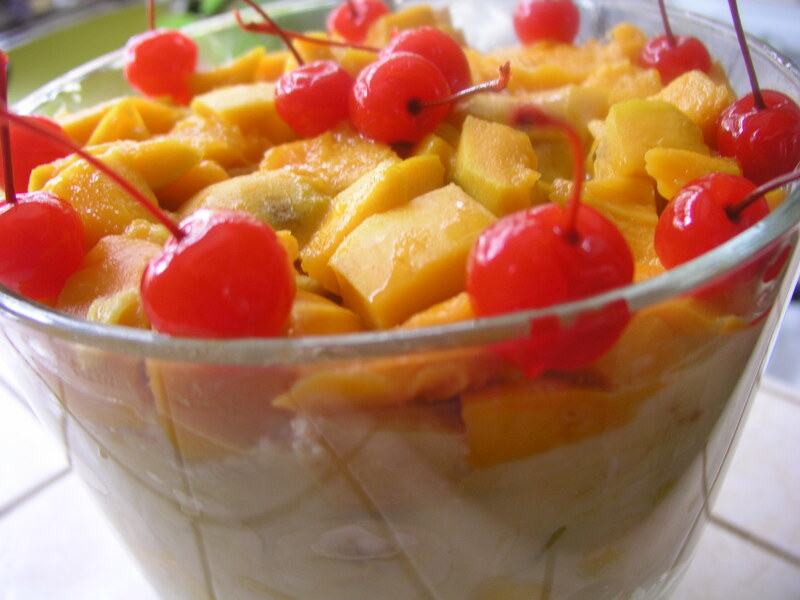 So many mango recipes to try. Thanks for hosting such a nice event. Looks like you had your work cut out. I’m getting worried as I am hosting something next month, for the first time! 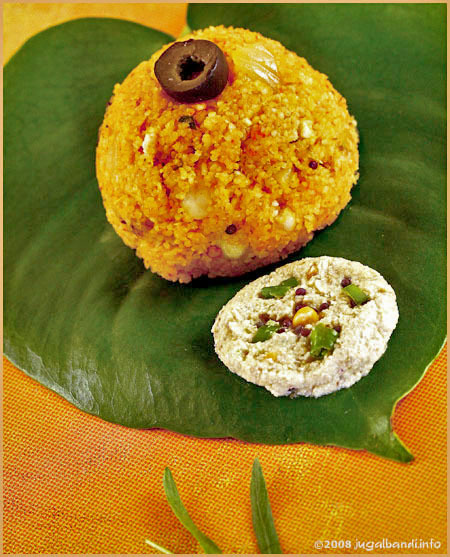 Wonderful round-up Arundati! 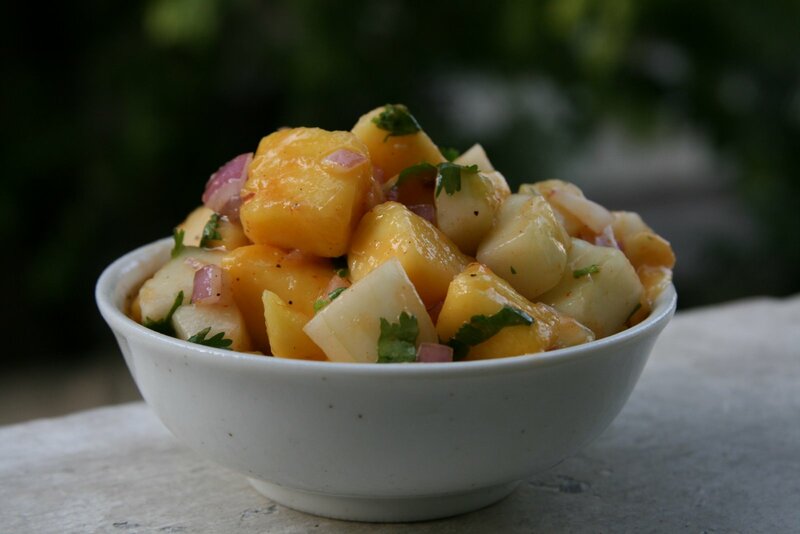 … Lots of yummy looking mango recipes out here 🙂 … Great job …. 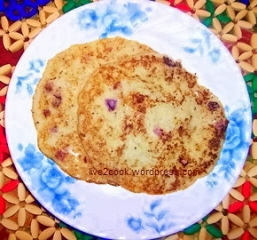 Good job with the round up, Arundathi…..
Lovely roundup with lots of recipes to be tried. 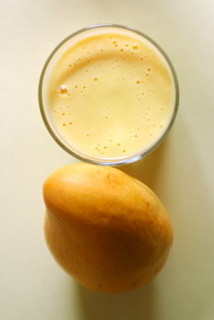 Should try them at the earliest else will hv to wait for the next mango season. Good work. 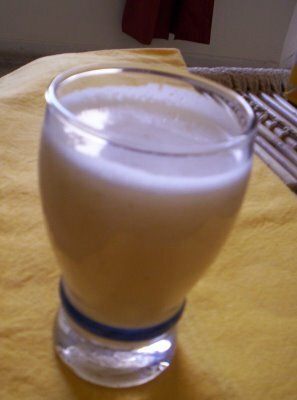 Arundati..that was a fabulous round up..imagine you were so scared..I was planning to send couple more..couldn’t finally…but no worries..am glad I didnt’ give any more work than these!..so many wonderful ideas to try!.. thanks for hosting such a lovely event and theme! 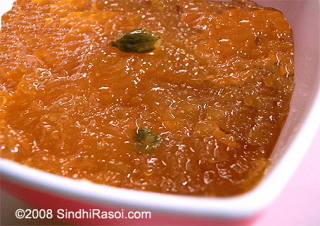 Amazing roundup,wonderful recipes and so tempting pictures what else cud anyone ask for ?